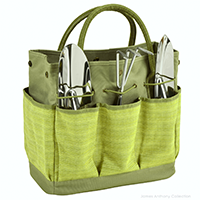 The Picnic at Ascot Gardening Tote and Tools Set in Hamptons will have your garden plants glad to see you coming. This practical and fun tote is made from 600D poly-canvas and includes a selection of stainless steel tools giving you everything you need to make the earth move in addition there's room inside the tote to hold more essentials like plant food, stakes, and gardening gloves. The Picnic at Ascot Gardening Tote and Tools Set includes a durable multi-pocket 600D poly-canvas gardening tote, 3 heavy gauge stainless tools with comfort grip handles and a rigid base with protective feet. Includes three stainless hand tools with soft handles that color coordinate with tote. Measures 13.5" wide x 6.75" deep x 12" high.